We’ve added a new feature to our LinkPost and LinkPost Jobs that many will find extremely beneficial. It’s called “Pre-Written Content” and in a nutshell, Advertisers create the content for the LinkPost they purchase and Partners use this content to create a new post on their blog. One of the most complained about items when it comes to LinkPost and LinkPost Jobs, is the actual content produced in the post. While there are many that do a wonderful job at writing original content, there are also many that just don’t quite meet the Advertiser’s standard. Due to this reason and suggestions from clients, we have implemented a new feature called “Pre-Written Content”. Think of a LinkBB and a LinkPost combination; the Advertiser creates the content and the Partner publishes it. The Advertiser gets a perfect post they are 100% satisfied with and the Partner gets a guest blogger making a new post on their blog and being paid for it. It’s “VERY” easy money for the Partner. For Advertisers, we’ve added a new radio option as shown below that asks if the new outline will have pre-written content or not. If you select “Yes”, a new pre-written content text field will appear where you will put the content in. <HTML TAGS ARE ALLOWED!> The best recommendation would be to either format your post with some sort of editor that allows you to insert the html tags, then copy the content with tags over to the pre-written content field. You can also submit the content without tags if you choose to not use them. All paragraphs and line breaks will be recognized and carried over. After you have completed the fields for the Outline and submitted, your outline will be saved and queued for review. Once your outline is approved, everything else will operate the same as before. We definitely recommend making each pre-written LinkPost unique. The most effective practice would be to select the blogs you want to publish your LinkPost on. Learn the blog and how they speak to their audience. Then do your best to make your pre-written LinkPost blend in well with the bloggers other posts. You’ll need to create a new outline for each pre-written post. Another recommendation is to go ahead and put the links in the content where you want it. This takes all of the work out of the Partner’s hands and you’re 99% certain it will be published exactly how you want it to be published. 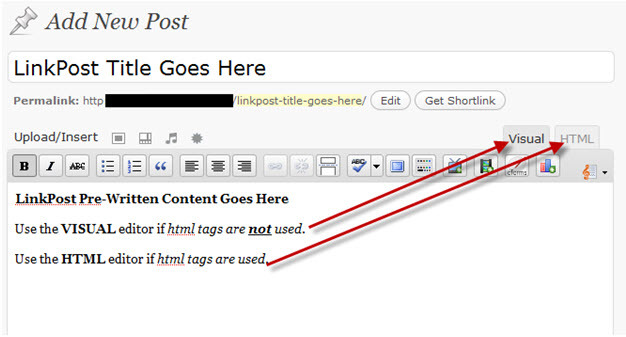 LinkPost just became really easy for Partners when pre-written content is provided! The worst part, for most, is thinking of what to say about said site/product or keywords. Quite often, the content falls short of what the Advertisers are hoping to see, so this option helps both sides. 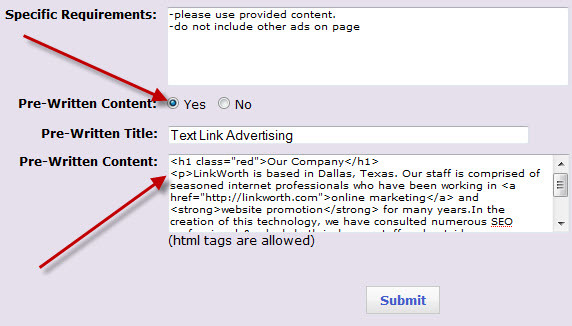 Partners will know when a pending LinkPost or a LinkPost job has pre-written content included. 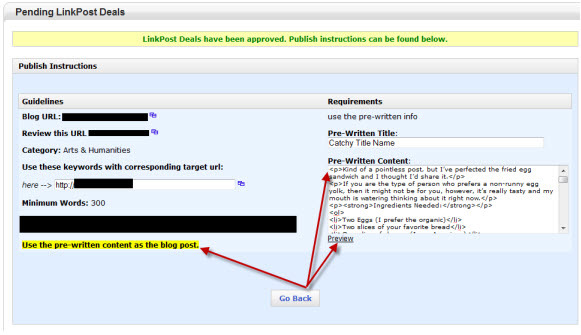 As you can see in the image below, you’ll see the yellow highlighted part that says “Use pre-written content as the blog post”. You’ll also see the content on the right side column. Once you click “Approve”, it will direct you to the next screen that gives the publishing instructions. On the Publish Instructions, you will see all of the usual items, but now if it includes the pre-written content, you’ll see it in the right-side column. All of the pre-written content will be inside the textarea box that will highlight with a single click, and then you can copy to your clipboard with a CTRL C (or right-click and choose Copy). Then go to your new blog post page and paste the content with a CTRL V (or right-click and choose Paste). Note: when using copy/paste that has html tags in WordPress, you will need to switch your wordpress editor to the HTML version. Otherwise the special formatting will be lost. This is an illustration of the two editors offered. If you would like to go over pre-written content before publishing, click the “Preview” link under the textarea box and it will open a new window showing the page formatted properly.